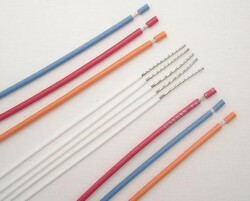 Asapwire.com will cut and strip hook up wire to your specifications to help streamline your assembly procedures. Finished wire is packaged and ready for assembly, whether it is Kynar wire for wire wrap and board reworks or hook-up wire prepped for crimping or soldering. A partial strip keeps the wire strands in ready-to-use condition with no additional handling required. To speed up your manufacturing process even more, we can tin one or both stripped ends. Asapwire.com makes it easy to order with a simple drop-down menu with options for colors and common wire and strip lengths. Feel free to inquire about custom lengths- we're happy to follow up and quote any request. We offer a quick turn-around on all of your cutting and stripping wire requirements. Call or order online today!